William Stokes of Stourbridge (the then "modern" name for the parish that had always been known as Old Swinford) styled himself a 'watchmaker' when he signed his long and detailed will on the 8th April 1724, and, as an afterthought when he felt death was close, its codicil on March 2nd 1725. A watchmaker always sounded grander than a clockmaker and a provincial watchmaker as early as 1724 was unusual enough to raise eyebrows with admiration amongst the locals. The will was proved in London at the Prerogative Court of Canterbury, the strongest court in the land, on the 13th July 1725, only four months after the codicil. I suppose clocks and watches must exist by William, though I have not personally come across any. Of course the main reason we search for wills is that they tell us about relationships within the family, and it was in order to learn more about his son, John Stokes, that I traced for a will for his father, William. But this particular will is exceptionally interesting not only for that reason but also because it illustrates some of the practices of clockmakers of the day, such as the workings of apprenticeships within the trade. We have lots of unanswered questions about how the trade worked, such as did fathers teach their sons their own trade as official apprentices or just informally? Well William's will was made at exactly the right time when his sons were in training and so provides the answer at least as far as that family was concerned. I am reminded by comparison of an incident which demonstrates that some clockmakers expected their sons to work for them for nothing with no formal apprenticeship. Years ago I bought a unique manuscript book of memoirs written in 1784 on the "Life and Times of James Upjohn", in which James tells that his father, clockmaker Edward Upjohn of Topsham in Devon "set as many of us (his children) as were able to work; for I remember I was obliged to work between school hours and after I came home from school; my father never suffered any of us to be idle - I was taken from school at eleven years old, and I can remember five of us (his brothers) all at work at one time at Topsham in making clocks and watches completely within ourselves." One day when he was working with his elder brother, William, about the year 1743, they asked their father when their term of "apprenticeship" would end. He answered when they were twenty one. But as they did not know their true ages they went to check by the only means they had available, that was by looking up their baptism entries in the church registers, and found they were already passed the age of twenty one. When they told their father, he burst into a rage and struck James such a blow that it knocked him off his workstool. Next day James packed his bags and left home for ever, with only five shillings in his pocket. William Stokes left his wife, Mary, "the bed and bedstead and all furniture thereunto belonging (i.e. the drapery) which is now in the parlour chamber of my dwelling house, and all such other household goods which she shall choose not exceeding the value of five pounds for her own use" - but only if she forfeits her "claim and right of dower to and in my dwelling house in Stowerbridge to my son William". The dower right was a widow's traditional right to one third of her husband's property. William asks her to forgo this for the compensation of a bed, bedding and a whole five pounds worth of household goodies. We might think this hardly seems the grand gesture of loving husband, Mister Magnanimous, but he does explain "I having made further provision for her by deed" - though what this deed was we do not know. So the eldest son, William, aged 23 when his father died, was to get the house his father had lived in "with the shop buildings" (perhaps a workshop) and "all my clocks, watches, plate and stock in trade with my best silver tankard, one silver spoon, and one half part of all my shop tools and my implements of trade". William also got the use of the other half of his tools until John finished his apprenticeship, at which time they were to become John's. John received "my silver tumbler, one silver spoon and all my cloths (clothes) and wearing apparel" if he finished his training under William, but if not, then he was to get only his half share of the tools. There are official records preserved of apprenticeships from 1701 onwards, yet these contain no reference to William's sons, William junior (born 1702 and John (born 1706). Yet William tells us that his eldest son, William, was already a practising clockmaker (his apprenticeship would have ended in 1722) and his younger son, John, was still an apprentice working under his father. He specifically stipulates that John "shall work for and serve my son William for all the residue of the time of his apprenticeship to me and at the end of such his service I do order my son William to pay my said son John twenty pounds", but if John does not complete his term with his brother, he shall forfeit the £20 and all other bequests except the half share of the work tools. 1. 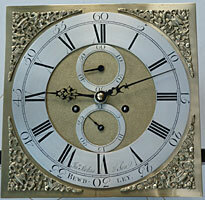 This classic twelve-inch eight-day dial of the 1750s is signed 'Jno. Stokes & Son BEWDLEY'. The '& Son' is a very unusual way of signing at this period. The quality and precision of this engraving is as good as it gets. Click for closer view. William had married Mary Gooding on the 20th October 1700 at Chaddesley Corbett. They had a total of ten children baptised at Old Swinford between 1701 and 1716, though some died in infancy. Apart from his eldest son, William, and second son, John, he left children Elizabeth, Mary, Sara and Stephen, amongst whom everything else was to be shared when they reached the age of twenty one. They were also to be paid then the remaining portion of a legacy from "my late uncle Tranter" out of Brookfields in Oaken in Staffordshire. William made express provision for his son, Stephen, then aged nine, that his eldest son, William, was to be responsible for Stephen's guardianship and tuition and was to provide ten pounds "for putting him forth apprentice at his age of fourteen years", and "I order him to maintain and keep him in cloths (clothes) until the age of one and twenty years". So here is confirmation that the normal age a lad was bound as an apprentice was fourteen. So it seems likely that William and John, and later Stephen, were all formally bound as apprentices. William was emphatic on his sons, John and Stephen, being properly trained. This was important, as a document showing proof of training might have meant the difference between a clockmaker finding employment later in his life, or not. And yet they do not appear in the official returns, where a tax was paid to the Inland Revenue on indentures. Yet when William took an apprentice from outside the family, being Nathan Hickman, bound to him on the 1st June 1714 for seven years at a premium (fee) of £20, the bond was registered with the authorities and tax paid at the rate of six old pence to the pound (making a total of 50p in modern coinage). So how could this be? Well, the answer is that no tax was payable on low premiums of less than one shilling, which would generally be the case when a son was apprenticed to his father. There would have been formal documentation in the form of indentures, but the government was concerned only with taxable items, not record keeping for its own sake. The term indenture is said to have arisen because anciently such an agreement was torn into two halves and any disagreement could be resolved by each party offering his half up to match against the 'indented' half of the other party - believe that if you will! 2. The clock in its original oak case, shows a classic country styling of slender elegance combined with simplicity. Such a clock could hold its own in any home, country cottage or mansion. Click for closer view. A Stephen Stokes who worked as a clockmaker in Smithfield, London, in 1744 and died in 1764 in Clerkenwell might, or might not, have been him. It seems poor Nathan Hickman died at Codsall, Staffordshire, in 1725 aged only about 25. It is interesting that William allowed ten pounds for the premium to bind his son, Stephen, as apprentice, yet he himself charged a premium of twice that when he took on Nathan Hickman in 1714. Twenty pounds was a hefty premium at that time, and it is significant that only a fine clockmaker could ask such a high premium. William junior practised his trade in Stourbridge whereas John moved away to work at the same trade at Bewdley, less than ten miles to the south west. We can deduce from William's will why this was. The eldest son got the house, workshop and business stock at Stourbridge, but it would not provide a living for two families, so John had no option but to move away and set up elsewhere. It was sheer economic necessity. John Stokes (born1706) prospered at Bewdley, but I have been unable to sort out the genealogy of the family there as there were too many John Stokeses living at the same time there. It looks as if he too had a son named John, born in 1729, and dying in early adulthood. The burial of a John Stokes in 1773 might have been this son, who would then have been 44 years old, his father 67. Some clocks are signed by 'John (or Jno.) Stokes & Son', a common enough sort of title for a family business in today's world but a most unusual way of signing in the mid eighteenth century and clearly designed to give acknowledgement to a son working alongside the father. A more usual way of giving a son working for his father a credit at that period was to sign the clock by surname only, such as "Stokes Bewdley", which implies that inclusivity. Was there some special reason for this, such as perhaps that John Stokes junior was an invalid or in poor health? We will never know. If we were to judge John Stokes's work from the example pictured here, then it is apparent he was a master craftsman, not some rustic self-taught clocksmith. His clock dial and movement are immaculately made, and both show that he was well aware of London styling and work practices - could that have been through his brother, Stephen? This work is every bit as fine as that of contemporary London and his dial is of up-to-the-minute fashion. He used a counter stop spring (what I call an anti-rattle spring) to avoid that annoying chatter you can sometimes hear when a clock strike is not set just right. This is what most London makers did, but Stokes did his differently, in his own manner. His calendar hand moves once a day, but he drives it from a twelve-hour knock-on pin, like a common thirty-hour clock, and uses a two-for-one intermediate gear so that two twelve-hour knock-ons move the hand just once in twenty four hours. Same result as in London, but his way of doing it. The oak case too is a simple country farmhouse case, but examination shows quite a sophisticated feature in the breakfront mouldings on the hood top, a touch that implies some knowledge of ancient architectural principles. When John Stokes senior of Bewdley died in 1789 aged 79, he was taken to Stourbridge and buried there on the 28th August. Here we witness another old tradition played out, that of taking a person back "home" so to speak to be buried where he was born along with his ancestors. I have not been able to unravel the descendants of John Stokes of Bewdley, but we can be sure that the clockmaking trade was passed down. Some records show a Jonathan Stokes but there was no such person, as this is a misinterpretation of "Jno. Stokes" on clock dials. "Jno." was short for John, not Jonathan, the latter in fact being quite an uncommon name in the early eighteenth century. The Stokes family were still selling clocks at Stourbridge as late as the 1890s. At Bewdley Joseph Stokes was a brassfounder as late as the 1841 census and William Stokes plied the same trade there "employing 3 men" as late as that of 1861. So from the birth of the first William around 1670 we have a continuing thread of the same trade (or related trades) for at least two centuries. Not a bad record for a little-known family of country clockmakers.